We are in this business for about 20 years.We have done lot of renowned work in Delhi and other states of India with foreign client as well.We have speciality in buliding awnings, tent strucutre and other works also. Our Director C.M. Singh is in this business for the last ten years .On this page we have given some fundamentals details regrading products given on site. 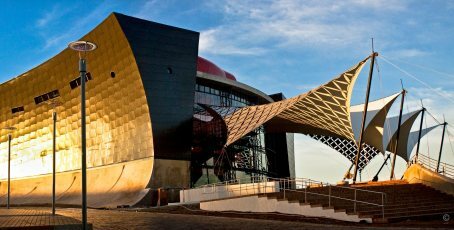 Structural fabric has the flexibility of form that sets it apart from both an aesthetic and a functional point of view, from any other conventional building material. The free-flowing, organic forms achieved by these structures are physically unachievable by the much more rigid structures. Our company “Sirouliya Enterprises Limited” is offer clients over 20 years of experience in the design, engineering, manufacturing and supplying of permanent fabric tensile structure such as car parking tensile structure, tensile structure India car parking tensile structures, entrance tensile structure, roof tensile structure, food court tensile structure, garden gazebo, swimming pool covering structure, auditorium covering structure, outdoor tensile structure, water proof fabric structure, landscape tensile structures, shades sails, modular tensile structure, stadium tensile structure & polycarbonate structure. We also offer Pre Engineering Structure & Pre- Fabricated Structure. We are prominent in serving the best of architecture and Engineering.These structure and covering are considered as per our client’s obligation and are manufactured utilizing tremendously resistant PVC coated fire retardant fabric with PVDF protection. Our Product range is extensively used in corporate offices, hotels, hospitals, retail malls, business complexes, residential apartments and amusement parks. Our company “Sirouliya Enterprises” is engaged in manufacturing and supplying of permanent fabric tensile structure such as car parking tensile structure, tensile structure india , car parking tensile structures, enterance tensile structure, roof tensile structure, food court tensile structure, garden gazebo, swimming pool covering structure, auditorium covering structure, outdoor tensile structure, water proof fabric structure, landscape tensile structures, shades sails, modular tensile structure, stadium tensile structure & polycarbonate structure. We also offer Pree Engineering Structure & Pre- Fabricated Structure. We assure you for the best architectural and engineered design. These structure and covering are considered as per our clients obligation and are manufactured utilizing tremendously resistant PVC coated fire retardant fabric with PVDF protection. Our Product range is extensively used in corporate offices, hotels, hospitals, retail malls, business complexes, residential apartments and amusement parks.